Maybe my grandma forgot to check it one day and it overflowed... will find out. For gods sake Andrew , spring for a decent wireless weather station for Granny . One you can link to the net . We desperately need a real time obs station at Wenty . And do you really want granny having to go out on freezing mornings to make sure the gauge is emptied ! Yeah, good to see you around Finners and Anewts. Sure is gorgeous in Megalong/Kanimbla ATM. I do think the prospects are good for some nice snowfalls this year but of course, we will have to wait and see. Just had a natter on the phone to a local in Megalong V. re the heavy showers etc of late. On one day in Feb (they think it was around then) they left the farm early with a nearly empty dam only to find it completly full when returning the next day. Flash flooding (and probably hail) had scoured the landscape and dug up the paddocks as if they had been ploughed. No kidding. Some of the most intense storms ever seen down there of late, locals reckon, including a hail smashed shed and another one flattened, probably by straight line winds. And another fella near Lowther has gone from nearly having to shoot his stock in December to now having some issues with bloat. The turn around in the areas around the CT's has been amazing and very interesting to watch. One thing I found really interesting when we went down to Junee a few weeks back, was how many dams were full to the point of overtopping, yet the paddocks were bare. Such was the nature of the rainfall that it was so sharp and short it all ran off into the dams with very little soaking in. Sounds much the same as the storms they have been receiving in the Megalon Blizz. unfortunatly, im not living up at Mt Buller for the season this year. but i will still go up for the holidays and weekends. Thanks guys, nice to be back too! I had a sample of cold weather in January (Utah and Wyoming) but like the line under your avatar Starwood, there was a b....y big high pressure system parked over us for days, so although it was freezing cold (around - 18C some days), not too much of that cowboy powder was falling. Fingers crossed for a big snow season in the CT's and Snowies this year. Thought some folk would find these magnifications interesting. They are public domain and free from copyright according to Wikipedia. 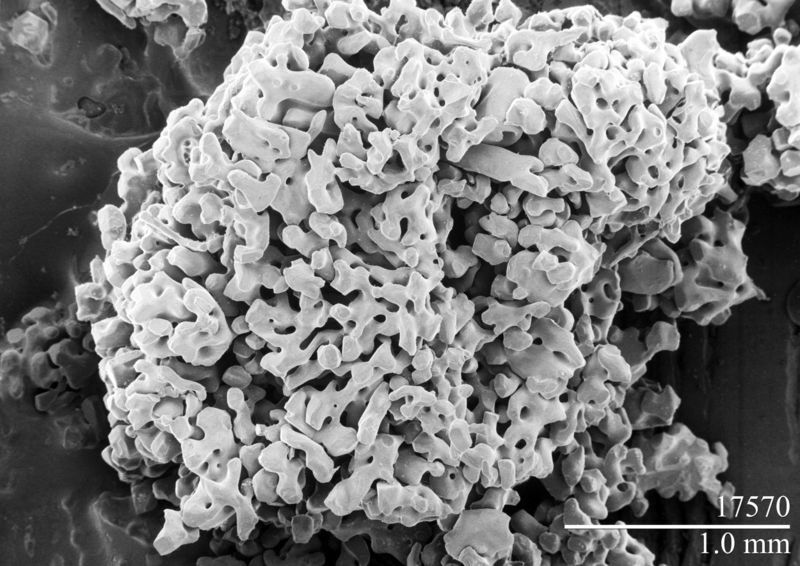 I find them incredible and a great example of graupel or snow pellets which are not uncommon up here in cold air convective cells along with snow grains etc from lesser cells. Been working a bit on this article too. Let me know of any errors, if you feel enclined. 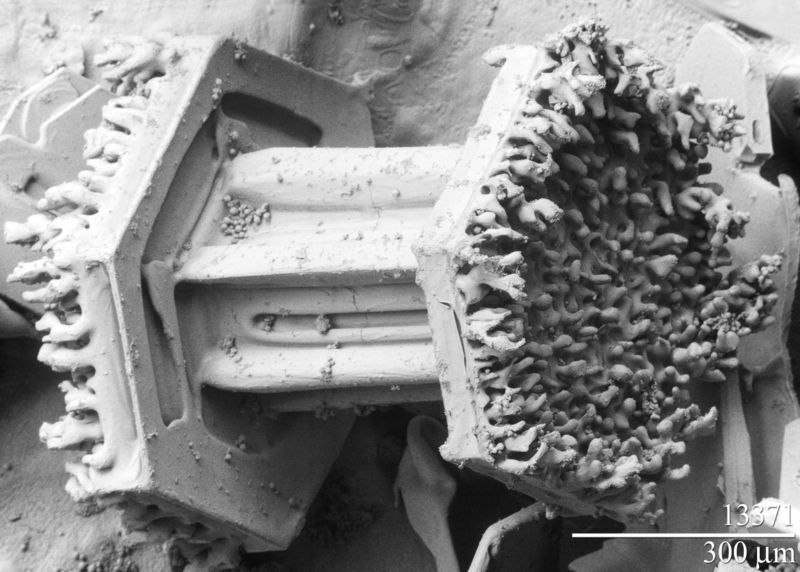 I had some trouble convincing people that saw those photos that it was actually magnified snowflakes! I certainly learned some more about snow from your article; I've never heard the term 'graupel' before, or the particular temps that define when rain becomes sleet. Let's hope that as a universal snowfall indicator for the south-east, the relative amount of man-made snow at Australian resorts is low this season! As often happens fog rolled over the eastern ranges with the easterly (driven in this instance by the coastal southerly) this afternoon. The rapid transition from normal visibility to completely socked-in is always novel. I had my camera handy when it arrived here so I took a few shots over the course of about 10 minutes, between poking about with other things. They're from nearly the same spot, looking ~north. Had a few mm earlier with a thunderstorm which passed to the north. Nice shots. Agreed, its always novel. Was working on the new pond (for the tank overflow)and the fog was welcomed here for sure. We had about 9mm from a short, strong downpour around 5pm and about another 4mm from drizzle overnight. Looks like a good vegie garden there Blizz? What's your summer growing season for things like tomatoes and the like up there at over a thousand metres? Its takes about five months to grow cherry tomatoes after putting them in during October. We don't even try to grow the big varieties. Still, this year has been good with five pumpkins set on the vine, two QLD Blue and three Butternut. Heaps of potatoes (kipflers) this year which on average was a better year than most. Stuff like silver beet and rocket also does really well. Also have grown some lovely mini capsicums and corn cobs are developing well. Thanks to Mrs Blizz for that info as I'm just the digger. Below is the most recent project just beyond the vegie gardens, finished today. Will post more in the water tank thread. 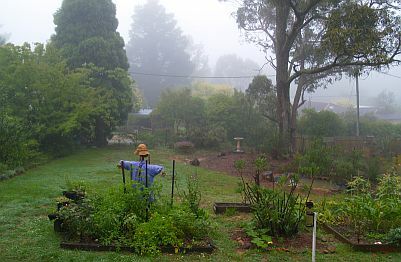 Misty/drizzly all day up here and good weather for working on roofs and in ponds. 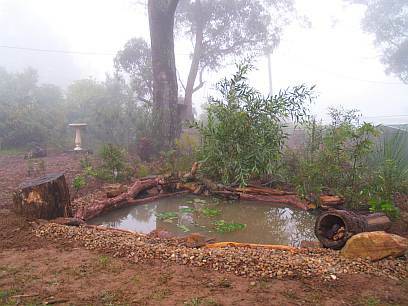 Congratulations on a pond well done...and yes it sounds like its been a perfect day to be mooching (I tend to mooch more than anything else) about in the garden. I tried growing potatoes once but they bolted. The warm season growing period here is like the sub-tropics; late August to May. The central western plains had the first ground fog in quite a while last week...during wetter years they happen a lot in the mornings here, but the photos that both you and Andrew have recently posted make me want to live high enough for the clouds to drop in more once in a while. Wasn't Misty Drizzly that Olympic swimmer from the US? We had the sun break through for a short while late this afternoon which showed up the jet stream cloud moving in over the low-level orographic junk. I thought it was a nice contrast. Caught up with some friends just out of town for dinner last night where upon much home veg' was picked and consumed, and mushrooms were picked from the damp paddocks in the mist. All this was very heartening after previous attempts at growing things this season largely failed due to frosts in November (advective followed by radiative on the 16th/17th), drought and grass hoppers. It's been nice to see more typical, moist autumn conditions about, and see the manifestation of the El Niño breaking down. Yeah, that Misty Drizzly was a good swimmer for sure. Gotta love the home vegies. Actually, there's one sitting at the computer at the moment. In a real pickle today. Have to say, Andrew's pics are a little more evocative than mine. This arvo, I have to go and see a man about a dog (literally) near Lithgow and also do some office supplies shopping so I will take the camera with me and look for some nice water shots if time permits. The property I'm heading to is hidden away in the bush so it should be fun and gives this little fidget a chance to get out of the office. Ripper. But what we saw on saturday was her lesser known sister Misty Eve Drizzly. She did come thru in a big rush even for the upper mts , but was quickly turned around by the storm that came the other way. Thankfully she returned later in the afternoon and her better know sister as well the following morn. She hung around all day , but it wasn't one of her better efforts. Nice to see the common occurance of Misty this Autumn. Hopefully her cousins Misty April and Misty May arrive in due course, followed by a visit from mother-in-law Icy June. LOL . It has been a good start to the year in many areas . Last year the only lass to show her face was Sweet F A . Its interesting to see how the mist seems to change local animal behaviour. The roos around our place come much closer to the house on the misty mornings and hang around a lot later. I was also surprised to find (actually they almost caused me to cardiac arrest) two black cockatoos in the branch above my car. I didn't notice them but thet startled as I opened the car door. Geez they are big birds ! Especially when they take flight 20 inches above your head ! Talk about ducking for cover ! Flanked by his scholarly mate August Snow (2 degrees). Is Sweet FA related to Pretty Dry? Rain threatens when she's about but invariably it Mrs Completely. Was up near Lake Eucumbene over the weekend. Saturday was interesting because of the impact of the local topography on fog and low cloud. In a southerly the ranges south of Lake Eucumbene are the highest bit of ground they run into and hence formed a magnet for fog and low cloud. For much of the day the hills immediately south of the lake (elevation c. 1300m) were either above or just below the cloud base, whereas on the lee side in Adaminaby there was no low cloud with only scattered middle- and higher-level cloud. It also showed up nicely in the maximum temperatures from Saturday at the two Cooma sites. The Visitors Centre, which got to 22, has higher ground to the south and was therefore presumably not affected as much by the low cloud. The airport, which has no such protection (both because it's a bit higher and because it has less topography to its south), peaked at 16 and was around 13-14 for most of the afternoon. It's very green on the eastern side of the Snowies at the moment (and all the way through the southern Monaro to Bombala) - obviously the recent rain has had an impact. On the other hand, on the Victorian side the grazing land around Bonnie Doon is as barren as anything I've seen this side of African famine footage. 8 registered (crikey, mysteriousbrad, ashestoashes, Ben K, LonnyDave, Adaminaby Angler, Aussea, 1 invisible), 75 Guests and 3 Spiders online. Generated in 0.038 seconds in which 0.024 seconds were spent on a total of 13 queries. Zlib compression disabled.